PSP Successor Has Touch Controls On Its Backside? 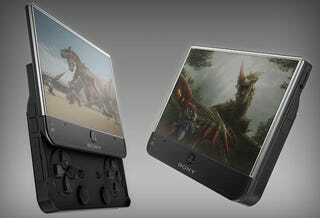 Sony has a lot of stuff on show to the public and the gaming press at GamesCom, but behind the scenes, the company is also reportedly showing off its next handheld. The unnamed PSP successor is, according to "three separate development sources" speaking with Eurogamer, around the size of the existing PSP-3000, and has a "rich and detailed" screen. The device's key feature, however, is its touch-sensitive controls, which are not on the screen, but rather behind it, on the back of the handheld. Eurogamer's sources differed on a release for the console, one saying it would be out in 2011, another saying it would be later than that. This is far from the first time we've heard a rumour about the PSP2 - indeed, it's closer to the 7142nd - but it is the first we've heard of these fancy touch-screen controls. Sony has been contacted for comment, and we'll update you if we hear anything back. UPDATE - Shockingly, Sony say it's "rumour and speculation".